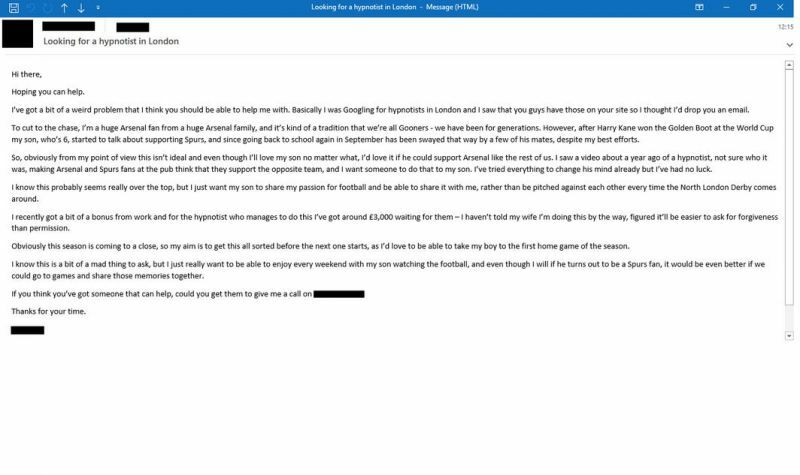 London: In a bizarre incident, an unnamed father of a six-year-old son in England has reportedly offered £3,000 to a hypnotist to convert him to an Arsenal fan from being a Tottenham supporter. The father has been an Arsenal follower, and wanted his son to follow his footsteps. In order to do this, he uploaded an advertisement on Bark.com, so that someone would reach out for him. While he said that his priority was to find a solution to the problem ahead of the 2019-20 season, he also added that his wife was not aware of this. He goes onto add that “it’ll be easier to ask for forgiveness than to get permission”. Despite all this, he said that he would continue to love his son. Arsenal, with 63 points in the Premier League, are competing against Chelsea, Tottenham and Manchester United for a place in next year’s UEFA Champions League. They next travel to Watford in the Premier League on Tuesday.